More than 70 alumni participated in the Webster UESTC IMBA Forum at the sprawling, new UESTC campus. More than 70 alumni participated in the Webster UESTC IMBA Forum at the sprawling, new UESTC campus in Chengdu, China. Former chairman of UESTC's Management Department, Zhao Biquan, IMBA director Liu Bo, IMBA senior consultant Fu Wenhao, and Webster China deputy director Nelly Zhang attended the event along with the alumni. Zhang shared 2015 highlights from Webster, including the new rankings for the University, the groundbreaking for a new interdisciplinary science building on the home campus in St. Louis, new certificate programs, and short-term study abroad trips, including the 2016 Summer Washington Program. 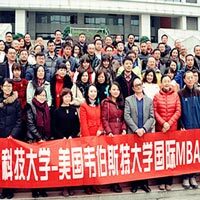 Liu Bo represented the Joint IMBA Program at Chengdu and welcomed all alumni, sharing the idea of how they created an IMBA song and presented the song at the event. In the main session, UESTC professor Chen Hong and four IMBA alumni shared their experience in business research and practices. Liu Hong, a member of the first class of the Joint Chengdu Program in 2003, shared her personal experience since 2002 when she started her own company: her start, bottlenecks and stabilization. Year-2015 student Zeng Tu also shared financial risk management under the big data environment, explaining how to use the big data to analyze companies’ risks and also how to manage companies in more effective ways. Read more highlights from this event in the full story at Webster China.